The third edition of the music festival It’s All About Piano returns to the Institut français at the end of March, with a wide variety of piano-themed events featuring musicians and artists from all around the world. 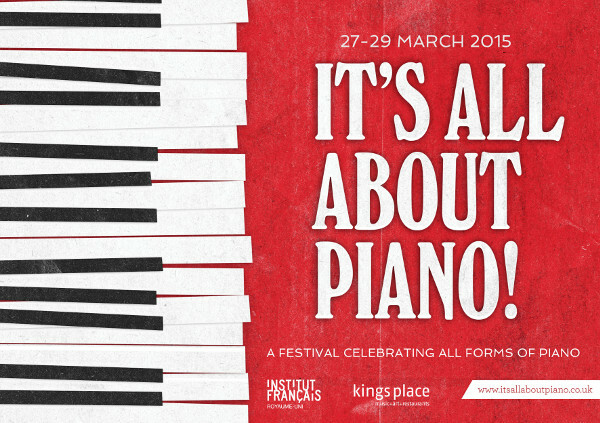 Curated by the Institut’s Head of Classical and Contemporary Music, Françoise Clerc, It’s All About Piano is the only festival in London that’s dedicated to this, the “king of instruments”. The festival aims to give its audience a chance to become more familiar with the instrument through events that combine piano playing with art, film and theatre. The festival also allows artists from a wide variety of different disciplines to work together. The festival will open on Friday 27th March with two multimedia recitals that will fuse animated images by the Brothers Quay and Kandinsky with music by Janáček and Mussorgsky, commissioned by the Cité de la Musique in Paris and performed by Uzbekistan-born French pianist Mikhail Rudy. That same evening, French-Cypriot pianist Cyprien Katsaris will improvise to a champagne tasting given by French Bubbles co-founder Maud Fierobe; this will be followed by a recital given by British jazz pianist John Taylor. All of these events will be held at Kings Place. On the Saturday and Sunday of the festival, events will move to the Institut français itself with recitals and readings, film screenings, a sing-along concert, a story-telling event, and free tuition for beginner piano players, plus workshops on How to Build Your Own Piano and The Art of Piano Tuning. The Institut français’ house bistro will also be turned into a ‘piano bar’ on these two days, with improvised jazz sessions being performed on both days. These weekend events will include recitals from international pianists François-Frédéric Guy and Peter Donohoe; a concert from Julien Gonzales, who is the 8-time winner of the Accordion World Championship; the London première of Messiaen’s La Fauvette Passerinette given by pianist and scholar Peter Hill who discovered the work in 2012; a collaboration between students from the Conservatoire National Supérieur de Musique et de Danse de Paris and students of the Guildhall School of Music & Drama recorded by BBC Radio 3; a masterclass with Angela Hewitt; and ciné-concerts with improvised accompaniment to French classics created by Louis Feuillade and Max Linder. Locals will of course know of the Institut français as a famed language centre, which today also comprises a multimedia library, cinema and French bistro. The centre also strives to contribute to London’s cultural life with many of its events that are held throughout the year – these include live broadcast screenings of the Opéra national de Paris and the Aix-en-Provence Festival; family chamber concerts organised in collaboration with the Cavatina Chamber Music Trust; and a network of contemporary classical music projects organised in partnership with the Franco-British fund for contemporary music, Diaphonique. The full line-up of It’s All About Piano can be found at institut-francais.org.uk/itsallaboutpiano, where you can also book tickets for all events.